Simone Chealde and her husband were faced with many questions and decisions when their youngest daughter was born with unilateral atresia microtia (AM) – the first time they had heard of the condition. From a position of nearly complete lack of knowledge about AM, Simone spent countless hours educating herself and family, searched the world for possible treatment options and chose for her daughter to undergo atresia repair and Medpor reconstruction over 5 years ago now. In addition, Simone has become certified as a teacher of the hearing impaired, started a support group in Australia for families impacted by atresia and coordinates the Hear & Say Center’s Microtia Atresia Conference held annually in Australia. Her first-hand challenges and experiences have led her to be passionate about equipping parents of hearing-impaired children with tools and advocacy skills to best meet the unique needs of their children. 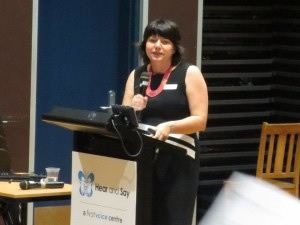 Simone presented at the 2013 Hear & Say Atresia Microtia Conference in Brisbane on the topic of Parent Advocacy. In the USA, the body of law governing education of children with hearing (and other) disabilities was passed in 1975 and is known as IDEA – the Individuals with Disabilities Education Act. IDEA was originally enacted by Congress to ensure that children with disabilities have the opportunity to receive a free appropriate public education, just like other children. The law has been revised many times over the years. The most recent amendments were passed by Congress in December 2004, with final regulations published in August 2006 (Part B for school-aged children) and in September 2011 (Part C, for babies and toddlers).